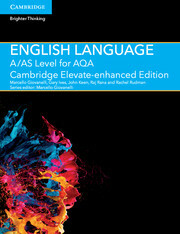 Created specifically for the AQA A/AS Level English Language specifications for first teaching from 2015, this enhanced digital resource is suitable for all abilities, providing stretch opportunities for the more able and additional scaffolding for those who need it. 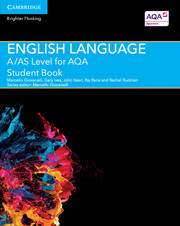 Helping bridge the gap between GCSE and A Level, the unique three-part structure provides essential knowledge and allows students to develop their skills through a deeper study of key topics, whilst encouraging independent learning. With rich digital content including video tutorials, this resource is fully accessible online and on tablet devices through the Cambridge Elevate app. The Elevate-enhanced Edition is fully customisable and interactive, with text that can be annotated, rich and varied video content and auto-marked questions. The Elevate-enhanced Edition also features a ‘My Work’ folder, enabling students to submit work and teachers to assess effectively, as well as track progress. BEGINNING: 1. What does language study mean at A Level? 16.8 Why does change happen? 16.9 How does change spread? 17.1 What is a language investigation? 17.3 What approach could you take? Gary is a Vice Principal at a secondary school in Yorkshire, where his responsibilities include overseeing learning and teaching across the school. As well as teaching A Level English Language, he is a Specialist Leader of Education writing and delivering professional development courses, and offering support to schools. He is also an accredited facilitator for the National College for their middle and senior leader professional development courses. Raj is an experienced teacher of English Language. She has written support and training materials and presented to a range of student and teacher audiences, as well as supporting schools and colleges new to A Level teaching. She has lectured for commercial companies at Sheffield Hallam University on aspects of A Level language teaching. Rachel taught English in a number of secondary schools in North and West Yorkshire before moving into higher education in 2013. Whilst teaching in school she held a number of responsibilities, including Leader of Key Stage Five English and Head of Department. She now works as a PGCE course tutor for English at Leeds Trinity University which involves close work with trainee teachers and local schools. For fourteen years, Rachel has also examined and delivered training to centres, new teachers and examiners in achieving success at A Level.